If you can hear screaming, you know you're still alive. "Cooked up by the evil minds involved in some of the UK's most successful horror attractions, House of the Dead ltd announce that Hell Has A Home and Manchester's Victoria Warehouse will be the lucky location for its second horror event. 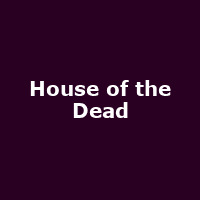 Packed with your worst nightmares, HOUSE OF THE DEAD will take you through an unreal world made up of phenomenal, horror movie quality sets, routes of terror and most importantly, the most horrific monsters Manchester has ever seen."